The traditional Navajo way contains no concept for religion as a sphere of activity separate from daily life. Navajo religion has been described as 'life itself, the land, and well-being.' All living things -- people, plants, animals, mountains, and the Earth itself -- are relatives. Each being is infused with its own spirit, or 'inner form', which gives it life and purpose within an orderly and interconnected universe. The interrelatedness of all creation is recognized through daily prayer offerings and an elaborate system of ceremonies. The purpose of Navajo life is to maintain balance between the individual and the universe and to live in harmony with nature and the Creator. In order to achieve this goal, Navajos must perform their religious practices on the specific, time-honored areas which they inhabit. In contrast to the Judeo Christian religions which tend to celebrate people and events, and thus can be practiced anywhere, the Navajo religion is founded on relationships to specific places. The Navajo religion is defined by and cannot be separated from its relationship to specific geographical places. These sites are sacred because of special religious events which have occurred in that particular site. The Navajo people believe that the Creator placed them on land between four sacred mountains: Blanca Peak in Colorado, Mount Taylor in New Mexico, the San Francisco Peaks in Arizona, and Hesperus Peak in Colorado. According to their own history, the Navajos have always lived between these mountains. The Navajo people have been instructed by the Creator never to leave their sacred homeland. The Navajo family's dwelling, the hogan, is a microcosm of their homeland. The posts of the hogan represent the four sacred mountains. A traditional hogan is constructed of logs, bark, and packed earth in a round dome-roofed shape, according to instructions found in the Navajo creation story. The sections of the hogan correspond to the structures of the universe, for instance, the earthen floor represents Mother Earth and the round roof symbolizes Father Sky. A hogan can never be abandoned unless it is struck by lightning or someone dies in it from a cause other than old age. The hogan is the site for all religious ceremonies, which sanctify it through use. The hogan constitutes one of the most sacred places for the members of a Navajo family and binds them to the land of their birth. A Navajo's relationship to the land where he or she is born is established at birth, when his or her umbilical cord is buried near the hogan. The burying of the umbilical cord symbolizes the transition from nourishment by one's natural mother to a life of nurturing by one's spiritual mother, Mother Earth. The child's afterbirth is offered to a young tree, such as Juniper or Pinon. The tree and the child grow together and share a sacred bond that continues throughout the life of each. The child's cradleboard is cut from the same tree, and is offered back to it when the child can walk. As the child grows older, parents and grandparents instruct him or her on how to perform ceremonial obligations to the land. Offerings of turquoise, white shell, jet and abalone are made to sacred sites such as rocks, springs, buttes, herbal gathering areas, and trees, to obtain blessings and protection. and the spiritual beings take care of us. We know the land, the spiritual beings know us here. The Navajos believe they have a responsibility to remain on and care for the land where they were placed by the Creator. Knowledge of sacred places carries with it the obligation to care for them through the appropriate offerings, prayers and songs. Such ceremonies necessitate regular, sometimes daily, access to sacred places and plants. Thus, for the Navajos, respect for the sacredness of their land requires occupancy. The story of the creation of the Navajo people and their emergence onto their sacred homeland is recounted in a ceremony known as the Blessingway, which is the foundation of the Navajo way of life. Blessingway focuses on the story of Changing Woman, who is the inner form of the Earth through its seasonal transformations. 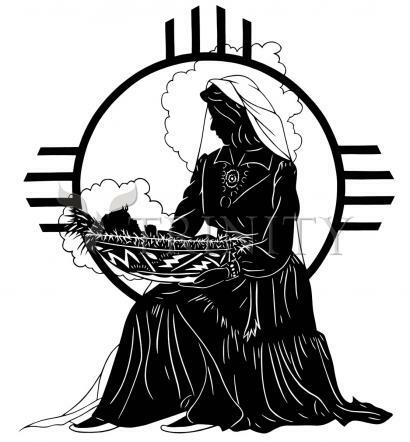 She is the major deity for the Navajo. The Navajo are instructed that in the beginning, First Man and First Woman emerged onto this world near Huerfano Mountain in New Mexico. One day, First Man found a baby on a nearby mountain. The baby matured in four days and became Changing Woman. Changing Woman created the four original Navajo clans from her body. Her sons rid the land between the four sacred mountains of dangerous monsters and made it safe for the clans to inhabit. The Blessingway recounts in detail the instructions Changing Woman gave to the Navajo people she created. These teachings concern history and major religious practices, such as girl's puberty rite and the consecration of a family's hogan. When performed in its entirety, the Blessingway is a two-day ceremony whose purpose is to obtain peace, harmony, protection, and to help realize the goal of a long happy life. Navajo healing ceremonies are used to cope with the uncertainties and dangers that occur in the universe. They are usually performed to bring the dangerous powers under control and to restore physical or spiritual imbalances in an individual. These curative ceremonies, which can last up to nine days, must be performed in a hogan by a specially trained medicine person. The medicine person often uses sandpaintings and herbal remedies made from local minerals and plants to heal the patient. Plants must be collected for each individual ceremony; they cannot be gathered in advance or stored in a kit. For example a medicine person must walk to the spot where a plant is growing and tell the plant the name of the person who is sick. Each plant is addressed as an individual with offerings of corn pollen, songs and prayers. The use of local plants for Navajo ceremonies illustrates the need for the Navajos to remain on their sacred land. “We pray without ceasing for our survival here, not somewhere else. The essence of the Navajo religion is the relationship between the people and their land. Their religion can only be practiced on the land they and their ancestors have held sacred for generations. Thousands of Navajos are currently threatened by the forced relocation mandated by Public Law 93-531. Forcibly removing the people from their land would deny them the ability to practice their religion, a right protected by the First Amendment to the United States Constitution.